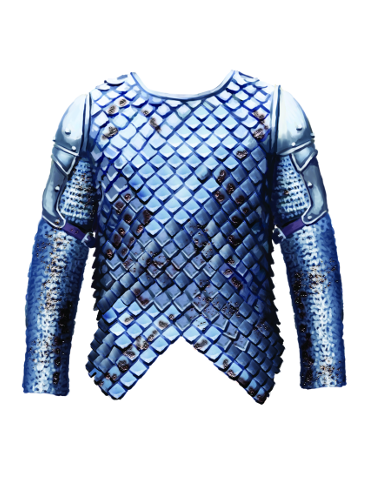 An average legionaire of the armies of Gore owns a cruder mass built version of this particular type of scale mail. Finer built lorica squamata, such as this particular example, are reserved to distinguished soldiers, lower rank officers, and standard bearers. Bastian was correct in his speculation. This armor has no signs of being used in heavy combat nor does it have any insignia as a mark of an officers rank, as it was worn by a gorian standard bearer who intentionally guided his unit and several other into demise before abandoning his duty. How did he manage to do that? One of the trade secrets that make the armies of gore the mightiest there is that the gorian standard bearers are taught a highly guarded sign language. The standard bearers wave their banners in specific patterns and act as communication nodes between the officers, which allows individual units to react swiftly to new orders and also to communicate the situation to the high command. 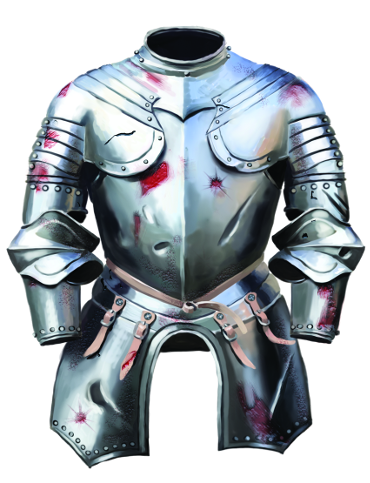 Excluding a few dents and blood stains, this armor is in polished and nigh mint condition. Mint it is not but it was used in real combat only once. This plate mail was worn by a traitor, one of the temple guards who turned against high priest Neshilim for a promise of a hefty compensation. It is far from being merely ornamental, but yet this fine armor wasn’t sufficient to protect the traitor from the swift end by being overrun by insectoids when he went to inquire after his long overdue payment. 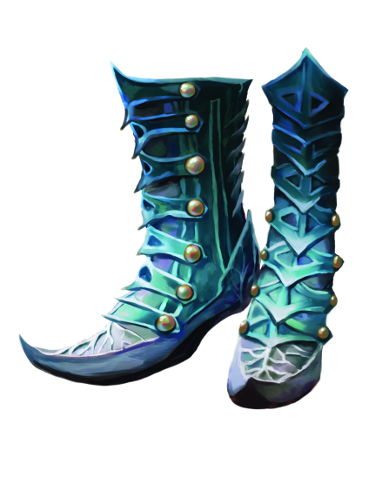 These fancy looking shoes are enchated with a relatively popular spell among the elves, or at least among the ones who can afford luxurious shoes and enchantments as they aren’t exactly cheap. They make their wearers reflexes just a little bit faster, senses a little bit keener, and movements a little bit swifter. Some call them “caffeine slippers” in jest and they are more right that you’d think as caffeine happens to be one of the components for creating the enchantment. Not the first thing anyone would expect to find from a chest. But when you think about it, it does make sense to hide such a valuable target out of sight. Or possibly the insectoids just followed their instinctive behavior and just happened to found an unusually good place to build a Nest. There’s a small hole at the back of the chest roughly the size of the opened jaws of a Boneworm. 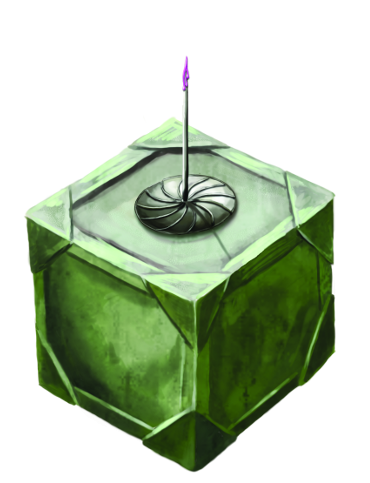 Obviously, opening the chest rendered that small hole completely obsolete and as the Nest already had the time to expand to its assumedly natural shape, making the act of closing the chest undoable. Academical matters aside, it’s all bad news. This mixture of Chi’leen spit and inert insectoid larvae is a strong contender for the title of the most repulsive beverage ever put together. 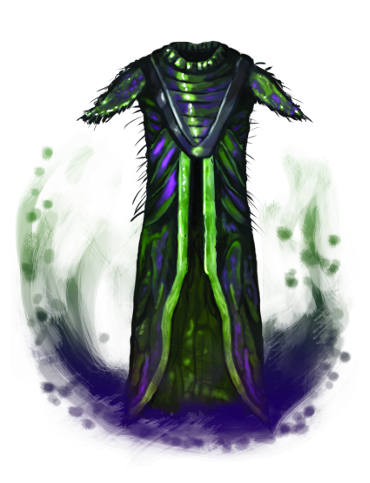 Though to its defence, it does have a strong refreshing and mild aggression causing effect due to the residual Chi’leen blood in the hulking insectoid’s own saliva. 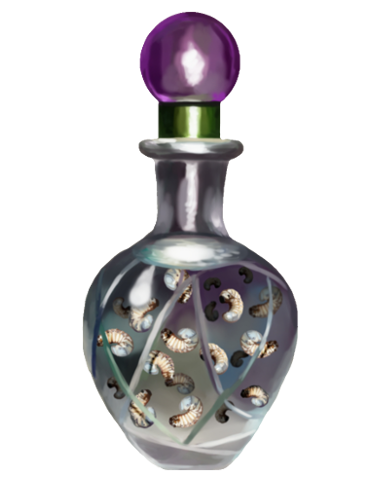 * On the downside, the inert larvae is might or might not be dead, meaning that some of them might wake up as a result of a sudden dip in stomach acid and cause one infernal of a stomach ache before dying. Luckily the stomach acids are too much for the tiny insectoid beginnings and they won’t cause anything worse than relatively minor bite-induced ulcers. *Chi’leen’s jaw structure and the amount and location of the teeth cause it to bite itself constantly. The constant pain is a partial reason to the creature’s furious behavior. 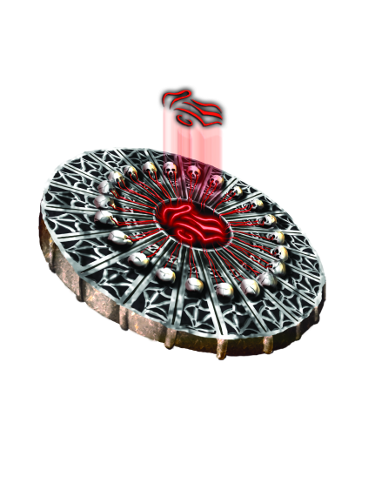 Sanguine Marks are powerful, extremely rare, magical artefacts capable of the ultimate feat of forbidden magic, resurrection. The rarity of the Sanguine Marks is largely explained by two facts. The first is that making one is heavily taxing even for the most powerful of the maguses. And the second is that the essence bounding ritual highly questionable to say the very least. Or rather, not the ritual itself, but the source of the bounded essence. Life has to be taken for the mark to give one. The quality of the essence, or “soul” as it is commonly known, also matters as the more innocent the source of the essence, the better, as wear and tear of the essence may give the Sanguine Mark highly undesirable side-effects (e.g. deformation of the body, paralyzation, drastic personality changes, insanity, and in the worst possible case the resurrected body might end up being controlled by something else than the soul of the late person). This particular Sanguine Mark though is one of the best ever made, a true testimony of the capabilities of its creator. And the implications of its mastercrafted nature you may piece together on your own, if you so desire. These robes used to belong to a con man, Abagnale Lustig, known among cult of The Chosen Ones as “The Great Prophet of Times to Come”. As he noticed that the cult had extended its corrupting influence all over the power structures of Zanziar, true to his nature, he saw an opportunity to benefit of these religious fanatics. He exploited a few of his contacts and got these robes made and enchanted with a spell that makes the robes emanate with aura of dominance and wisdom. It didn’t take much of effort from him to pull off his plan and get treated like a king until he faced his first insectoid. The shock of the unexpected encounter with a creature alike to those he had only seen in his childhood nightmares made him drop his act for one fatal moment. The insectoid smelled his fear and mauled him badly, but unfortunate to him, not too badly to be kept alive and tortured for 30 days and 30 nights. His fate aside, it doesn’t take much of cunning to realize the exploitation potential of these robes. A simple spring and trigger mechanism that launches a needle of the same venom The Chosen Ones use for their blowpipe darts. The venom is collected by “milking” boneworms. Depending of the dosage and concentration, the poison’s effects vary between general numbness to complete shutdown of the nervous system. It takes a boneworm several bites to incapacitate an adult human, but then again, they will always get their meal in the end if the meal is even a tad too slow to deal with their more predatory brethren. Simma surely seems to know what the amulet is all about and as a self-proclaimed prophet of the True God he should know, right? But it might as well just be a good luck charm that actually works. As a theological matter this is a very interesting topic since there’s currently no real way of deducing whether brilliant magic like this would originate of a being that is in its very essence magic or not. It might as well be just a work of a genius enchanter. The icon on the amulet surely fits to Simma’s story but one opinion does not a fact make. 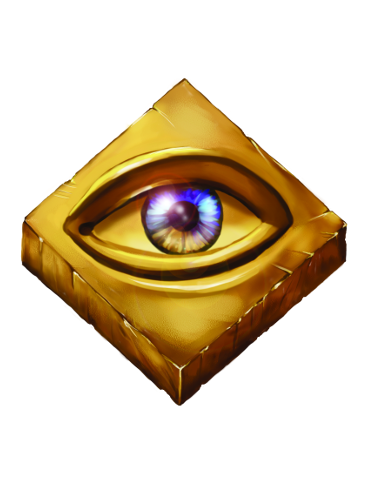 And besides, an eye icon has always been one of the most common icons chosen to symbolize anything from divine beauty to the watchful eyes of a city guard. Halcyon Mediengineering developed and launched this modern wonder of first aid drugs right before the company filed for bankruptcy. 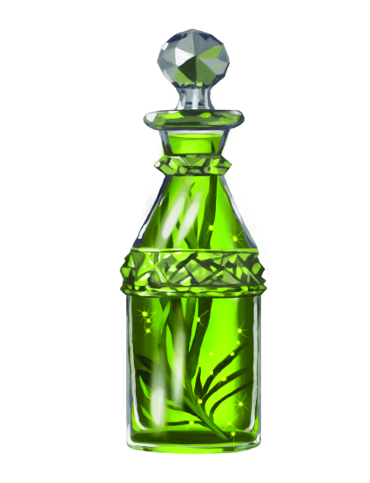 It combined all of the qualities of the most potent of healing magic into one easily orally or intravenously applicable medicinal product. The product was drawn from the global market shortly after the launch causing Halcyon’s decade long product development investments to go in vain and causing the already struggling company to drown in its debts. While the product was indeed brilliant and did exactly what it promised, it had one short coming, and that is that to this date no magus or engineer has figured out how to tamper with the being and essence of a sentient creature without leaving marks behind. 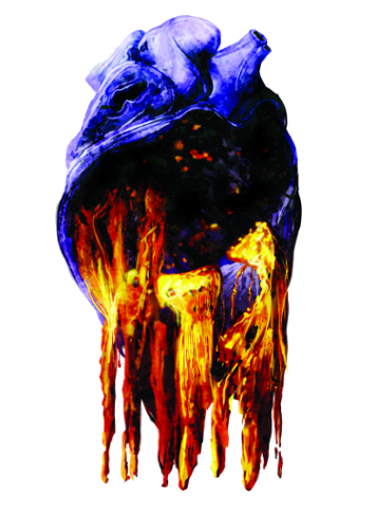 In this case the marks were severe post-traumatic stress reactions caused the immense pain due to flesh and bone suddenly shifting into its original position and mending together. The more severe the wounds, the more intense the sensation of pain. Originally found by a druid hermit in the mountains north of Gory. She used this to connect with forest spirits and learned how to harness its powers. A skilled user can connect to another player and extend their special ability to them. More coming later… Stay tuned!